The magic and wonder of the Great Smoky Mountains is always waiting for you, no matter the season. From breathtaking mountaintop vistas to tranquil hiking trails through verdant forests, the splendor of nature is on display all year long. Here are six fun, unique and memorable ways to experience the beauty of the Smoky Mountains. 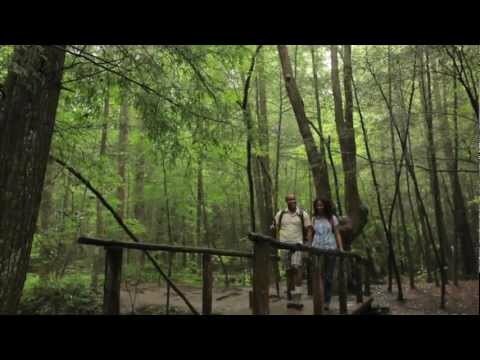 Immerse yourself in tranquility and reconnect with nature on over 800 miles of hiking trails throughout the Great Smoky Mountains National Park. Over 150 official trails to choose from adds up to 150 unique experiences and vistas waiting for your discovery. Ramp up your sightseeing on an exciting Smoky Mountain zip line experience! Get a whole different point of view as you soar through a tree top canopy above the forest. Experienced guides will be there every step of the way, to ensure a safe and memorable experience for you and your family. If you’re even more of a thrill seeker, you’ll love spending a sunny afternoon conquering the rapids during a whitewater rafting adventure in the Smoky Mountains. You and your family will be taken out on the Upper or Lower Pigeon River by an experienced guide and given the opportunity to see a side of the Smoky Mountains you have never seen before, from the comfort of an inflatable raft. Take a short hike to the top of Mt. Leconte, the tallest peak in Tennessee at 6,594 feet above sea level. The third tallest peak in the Great Smoky Mountains National Park offers sweeping views of the undulating peaks and valleys that form the Blue Ridge chain of the Appalachian Mountains, shrouded in the mist that gives the Smoky Mountains its name. Slightly higher than Mt. Leconte is nearby Clingmans Dome, the highest point in the Great Smoky Mountains National Park. It straddles the Tennessee-North Carolina border, and features a 54-foot observation tower at the top where you’ll marvel at endless, spectacular vistas over 100 miles and into seven states on clear days. Sunsets are beyond beautiful, and if you stay a little longer until night falls, you’ll be treated to a sky filled with so many stars you’ll feel like you can reach up and grab one for your very own. Bike riding is a great way to experience a vacation destination, and the Cades Cove Road Loop is a great way to see the Smokies. Cades Cove is an isolated valley located within the Great Smoky Mountains National Park. It’s one of the most popular destinations for visitors due to its well-preserved historic homesteads, scenic mountain views, and array of wildlife. The 11-mile Cades Cove Loop is the most popular route in the park and possibly the most scenic part of the entire Smokies, winding through wide pastures and past wide valleys, hayfields, wildflower meadows and tall mountains. You’ll also pass three 19th-century churches and many restored houses, log cabins, and barns. All are open for exploration. At 407 feet in the air, the Gatlinburg Space Needle is one of the best places to catch unbeatable 360-degree views of the Smoky Mountains and the Gatlinburg area. The tower is served by two glass elevators that carry visitors to a wide observation deck offering unimpeded panoramas of year-round beauty. Educational exhibits in the observation deck also enhance your visit with interesting facts and history about Gatlinburg and the Smoky Mountains. Hop aboard the 200-foot high Mountain Wheel in nearby Pigeon Forge and enjoy amazing mountain views from an enclosed, climate-controlled gondola. This modern ferris wheel is located at the center of The Island, a family-fun entertainment and shopping complex in the heart of Pigeon Forge. Get up, up and away on an early morning hot air balloon tour of Smoky Mountain National Park and catch a colorful sunrise as the sun peaks over the peaks in shades of red, pink and orange–it’s truly a spectacular sight to behold.